Where can I begin with Heather and Peter. They were an absolute dream couple to work with, and I felt they just got my style at Sincerely May. I just knew their city wedding was going to be stunning, but when Heather sent through the photos I just stopped what I was doing to take it all in. On the run up to the big day, I get so many emails from couples that I never get to see what the bride and groom look like most of the time. It was so lovely to see their faces and see what a beautiful couple they were. 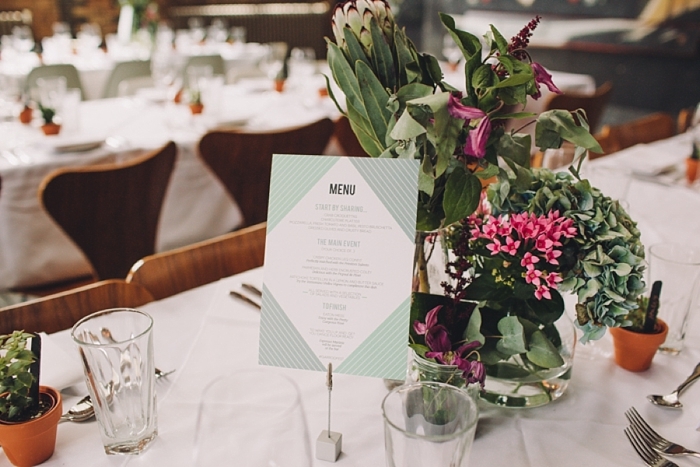 Heather and Peter had a london wedding with the most stunning geometric wedding details, whilst using my geometric wedding invitations to help enhance their day. Heather got ready at the iconic London hotel St Pancras, and the wedding ceremony was held at Camden Town Hall. 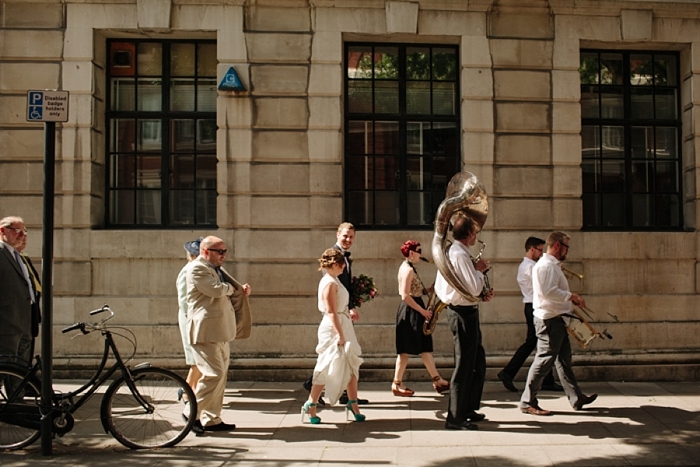 The reception was followed at 06 St Chad’s Place in London which has an urban wedding feel. 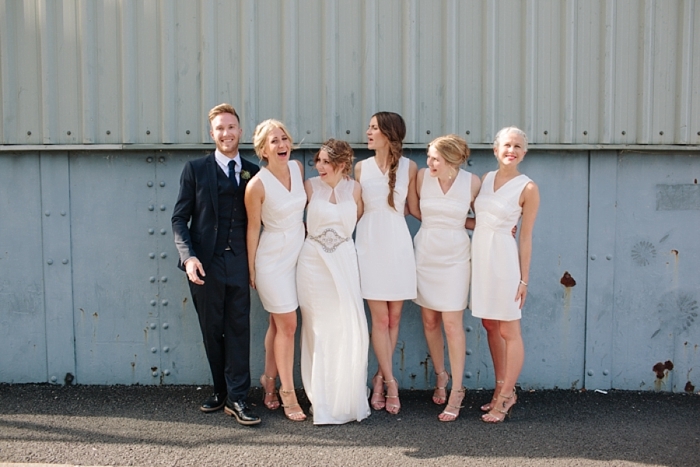 I might live in the Cornish country, but I love an urban industrial London wedding. The red brick, open plan-ness of this venue gives off the uber-cool vibes. If you are after an ethical wedding dress, then Heather wore the most stunning of wedding gowns by Sanyuk Tashrestha. Sanyuk creates the most beautiful ethical wedding dresses and I would highly recommend you checking out her styles. Can we also just take a moment to appreciate her teal green Miu Miu wedding shoes with the jewelled encrusted heels. I love a bride that wears a contrast colour heel! Peters suit was from London Savilles Rows Hardy Amies. Heather and Peter hand folded 1000 paper cranes as decoration for the warehouse industrial styled day. They hung off the ceiling beams. The time and effort that they put in before the big day really paid off, as the impact of this is just truly stunning. As an extra special touch, they included the folded paper cranes in their thank you cards as an extra special memory for their guests. I loved the jewel colours of her bouquet, which is a fresh look to a wedding floral bouquet. Heather and Peter, used my Geometric house collection for their day which suited the industrial look of their day. Heather and Peter didn’t have a set colour theme as this was not their style. However they do love plants, so they tied in the light greens to sit back with the look they wanted to create and the colours worked really nicely with their favours which were mini succulents. I designed a geometric table plan, geometric place cards and table numbers. I thought this was a great and unique idea for wedding favour. I mean, who doesn’t love a succulent! This is what Heather said about working with me at Sincerely May. It was an absolute joy to work with Heather and Peter, and I was incredibly proud to be a part of their day.